Virender Sehwag gave a ruthless display of his stroke-making abilities as India’s top-order batsmen today hit form after a prolonged lean trot in the first cricket Test against South Africa, which was headed for a tame draw. After forging a 218-run opening stand with fellow Delhi'ite Gautam Gambhir at the Green Park stadium here today, opener Virender Sehwag said playing for the same side in domestic cricket helped them stitch together the partnership. The approach of the South Africans in the first cricket Test against India today drew flak from former England batsman Allan Lamb who said such defensive tactics would not produce a result. With a solid display of batting by centurion Siddharth Sharma and his three-figure partnership for the third wicket with skipper Sunny Sohel, Punjab tightened their grip on the North Zone Vijay Merchant cricket tie against Haryana at Delhi Public School grounds here today. Former Australian bowling great Dennis Lillee has ended his 15-year coaching stint with the country’s cricket academy after rejecting a pay cut, a reduced workload and a reshaped role. Irina Brar is back after setting the Delhi Golf course greens ablaze. A nagging pain did not deter this golf icon from setting two records during the Northern India Open Ladies Amateur Championship. Hosts Punjab and Chhattisgarh made a winning start in the eighth Nacchhattar Singh Gill Memorial All-India Basketball Tournament for men and women (under-20), which got underway at floodlit courts of Government Senior Secondary School, Kotkapura, yesterday. Gurminder Singh of Delhi Zone upset defending champion J.P. Saroya of Punjab Zone to win the 800m race with a time of 2:13.96 seconds in the All-India Punjab National Bank Inter-Zonal Sports Meet, which began at the Karnail Singh stadium here today. The 20th sub-junior Punjab boxing championship will be held at SAI centre, Mastuana Sahib (Sangrur), from November 25 to 27. A controversial golden goal by Habil Topno enabled Border Security Force (BSF) oust strong contenders Punjab and Sind Bank 3-2 to enter the semifinals of the 41st ONGC Senior Nehru Hockey tournament here today. The hard-hitting Sehwag (164) not only notched up his eighth Test century, but also achieved a number of individual milestones to steer India to a formidable 401 for four in their first innings at close on a fog-hit penultimate day. The home team’s middle order, most of whom have been woefully short of runs before the current series got underway, took the opportunity to regain their touch on a lifeless track at the Green Park stadium. Vice-captain Rahul Dravid was batting on 52 and V.V.S. Laxman was giving him company on four at stumps with India trailing by 109 runs. Newcomer Gautam Gambhir (96), Dravid and skipper Sourav Ganguly (57) got into the run-scoring groove on a day which saw just four wickets fall. Only 13 wickets fell in four days of play, reflecting the placid nature of the track. With the possibility of fog delaying the start of the last day’s play tomorrow, the match is heading towards a tame draw, with the only point of interest being whether the home team can gain the first innings lead. Play began one hour late from the scheduled start at 9 am today because of the fog, but despite the heavy conditions, the South African pace bowlers could obtain no movement from the pitch, which showed no signs of wearing down. Resuming at the overnight score of 185 for no loss in reply to 510 for nine declared, the day clearly belonged to Sehwag, who was first involved in a record 218-run opening partnership with Gambhir and then emerged as the highest individual scorer against South Africa at home. The dashing Sehwag turned on the heat from the very second over, producing a pleasing cover drive to the fence off Makhaya Ntini and then spanking Shaun Pollock to the boundary. But he was at his belligerent best in the post-lunch session, clobbering 54 runs off just 35 balls. The two Delhi batsmen recorded the second highest opening partnership in Indian Test history when they crossed 213, the previous record by Sunil Gavaskar and Chetan Chauhan against England at the Oval in 1979. It was the sixth 200 plus partnership by an Indian opening pair so far. But Gambhir fell just four runs short of what could have been his maiden Test century. The left-hander, playing in his second Test since making his debut against Australia in Mumbai earlier this month, edged an away, going delivery off Pollock to wicket-keeper Thami Tsolekile. He occupied the crease for 246 minutes and faced 151 balls during his knock of 96, which included 11 boundaries and a six. 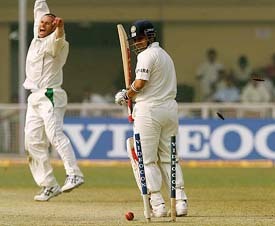 Sehwag launched a blistering assault on a clueless bowling attack, which also helped him complete 1,000 runs in a calendar year. He has hit three centuries from nine Tests played so far this year. Sehwag broke loose immediately after the lunch break, spanking the first ball by Hall to the boundary, and kept up the tempo with a flurry of strokes in the extended post-lunch session, much to the delight of the vociferous home crowd. He rattled up 54 runs in just 35 balls after the lunch interval before falling leg before to Hall, who also scalped the prized wicket of Sachin Tendulkar (3) in the span of four overs. The Delhi opener was particularly severe on Hall, smashing him for 18 runs in an over, and then hammered medium-pacer Zander de Bruyn and spinner Robin Peterson for 14 runs each in an over to dramatically accelerate scoring. Sehwag occupied the crease for 326 minutes and faced 228 balls during his rollicking knock of 164, which contained 20 boundaries and two sixes. His magnificent effort eclipsed Mohamad Azharuddin’s record individual score of 163 not out at this venue in 1996-97. 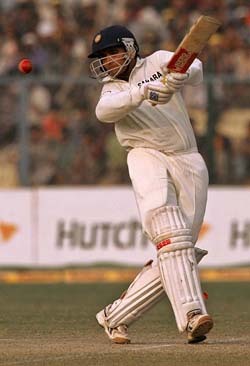 Tendulkar holds the record of the highest score by an Indian against South Africa with 169 in the Johannesburg Test in 1996-97. But Tendulkar never really looked comfortable during his 21-minute stay at the crease and returned to the pavillion when Hall knocked off his middle stump with a superb inswinger. The pace of scoring dropped considerably after Sehwag’s dismissal with Dravid and Ganguly playing cautiously. Ganguly got a reprieve when on 12, with Martin van Jaarsveld dropping a difficult chance in the mid-off region, Peterson being the unlucky bowler. The Indian captain was in a more attacking mood after the tea break, unleashing some glorious shots on both sides of the wicket, picking up Ntini for special treatment by hammering him for two boundaries in the same over. 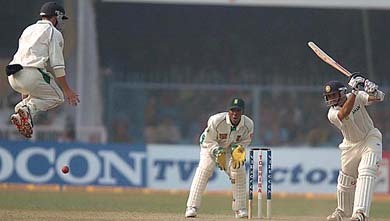 South African captain Graeme Smith claimed the second new ball after 96 overs, but there were no immediate results as Ganguly and Dravid had got used to the slowness of the track by then. 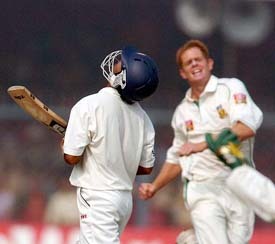 Ganguly notched up his 23rd half century, but perished soon after, with his short-arm pull landing straight into the hands of Peterson at fine leg, part-timer De Bruyn providing the breakthrough. South Africa (1st innings): 510 for 9 dec.
FOW: 1-218, 2-294, 3-298, 4-394. After forging a 218-run opening stand with fellow Delhi'ite Gautam Gambhir which brought India back into the first Test against South Africa at the Green Park stadium here today, opener Virender Sehwag said playing for the same side in domestic cricket helped them stitch together the partnership. The Delhi duo put on the highest opening partnership at the ground, eclipsing the previous 162-run record set by Devang Gandhi and Sadagopan Ramesh in 1999-2000. ‘’Because we play in the same side, our running between the wicket was better. In fact, the right-hand-left-hand combination also paid dividends. Our presence in the middle boosted each other for we have played together so many times,’’ he said. 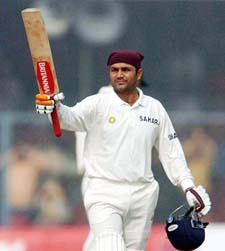 Sehwag, however, was not ready to rue that he fell 36 runs short of a Test double ton here. ’I am not disappointed because I did not throw my wicket,’’ he remarked. ‘’Though it is called a batsman's wicket, batting was not so easy and scoring a century was quite tough. I am happy with my show,’’ he added. Delhi southpaw Gautam Gambhir was clearly upset at missing his maiden Test ton. ‘’Of course, I am disappointed that I could not get that,’’ he said. “There is not point in batting till the third day, that will not bring any result,” said the cricketer, who was born to English parents in South Africa and played domestic cricket in that country in the initial stages of his career. Lamb was also critical of the South African Board’s transformation policy and said form and not colour should be the criteria for selecting a team. “I do not support Omar Henry for forming a coloured team. You have to consider their form and not their colour to include them in the team,” he said at a press conference here. The 50-year-old, who made both his Test and one-day debut against India, also said South Africa were struggling because they lacked quality fast bowlers, especially since the retirement of Allan Donald. KANPUR: South African vice-captain Boeta Dippenaar defended his team’s bowling tactics in the first cricket Test on Tuesday, saying the condition of the pitch prompted them to resort to such a strategy. “I do not think it was negative tactics though the Indians might feel that way. The conditions were not conducive for the bowlers. We have got to do what we believe is the best for the team,” Dippenaar said. He said, “It was a mixed bag for us today. We managed to take a couple of important wickets, but the Indians also batted well, particularly Sehwag, who seriously put our bowlers under pressure. With a solid display of batting by centurion Siddharth Sharma and his three-figure partnership for the third wicket with skipper Sunny Sohel, Punjab tightened their grip on the North Zone Vijay Merchant cricket tie against Haryana at Delhi Public School grounds here today. On the second day of the match today, Punjab gained a lead of 209 runs and consolidated their position by dismissing Haryana’s openers in the second innings. At draw of stumps, the hosts were struggling at 37 for 2, needing 172 runs to avoid an innings defeat. Resuming at 121 for 2 in reply to Haryana’s first innings total of 131, Punjab amassed 340 after 330 minutes of batting in 110.3 overs. Their overnight not out batsmen Siddharth and Sunny added another 72 runs before Praveen Panwar struck in the 58th over to dismiss Sunny when the batsman had made 84. His knock lasted 135 minutes, during which he faced 107 balls and hit 14 fours. He was also associated in a 130-run partnership with Siddharth. The duo needed 239 deliveries to score these runs. Siddharth completed his century and remained unbeaten on 119 after facing 315 balls. His knock was studded with 15 hits to the fence. Barring these two, none of the Punjab batsmen impressed and wickets continued to fall at regular intervals from the other end. Shrey Choudhry took 3 for 67 while Prem Prateek and Pawan Bhardwaj bagged two wickets each. Haryana began their second essay disastrously, losing both openers cheaply. Nitin Saini could score only 15 while Narender Sharma was bowled by Amarpreet Singh for 2. At draw of stumps, Himanshu Sharma and Parveen Panwar were batting on 14 and 1, runs respectively. Brief scores: Haryana (first innings) 131; Punjab: (first innings): 340 (Simranjit 28, Siddharth Sharma 119 not out, Sunny Sohel 84, Gaurav Gambhir 18, Shrey Choudhry 3 for 67, Prem Prateek 2 for 85 and Pawan Bhardwaj 2 for 42); Haryana (2nd innings) 37 for 2 (Nitin Saini 15, Himanshu Sharma batting 14, Sumit Kalia 1 for 10 and Amanpreet 1 for 13). According to a report in The Daily Telegraph today, Lillee was unhappy with a new proposal put to him by the Centre of Excellence. In a strongly worded letter, Lillee said he did not like the new role that was given to him, which required him to work with Test players rather than upcoming youngsters. “A proposal was put to me by the cricket academy (the Centre of Excellence) to cut my days down from 30 to 15 per year. They also did not want me to do the states, so I would have had no contact with the ones who really needed the help, the under-17s and the under-19s,” he said in the letter. “They wanted me to focus on the academy and the Test players and wanted to cut my work down to about half the days and for me to take a discount on my daily rate,” he wrote. Thirtythree cars from 11 countries and 32 other support vehicles began their gruelling journey on way to the first Indo-ASEAN car rally, flagged off by Assam Chief Minister Tarun Gogoi here this morning. Speaking on the occasion, the Chief Minister termed the rally as a great event which would create new vistas between the North-East and the ASEAN countries. Thousands of villagers, including schoolchildren, lined both sides of National Highway 37, waving the Tricolour and cheering the participants. Rally chairman Razat Mazumdar said the rally was running behind schedule. He hoped that the participants would make up lost time before they reached Kohima. Describing their experience so far, Mr Saleh, one of the participants, representing Brunei, felt that this rally would improve relations between India and Brunei while Mr T. James of Singapore said it was a unique experience. According to a report from Golaghat district the participants were saluted by a number of elephants when they were passing through the famous Kaziranga Wildlife Sanctuary. Media co-ordinator of the rally Abhijit Dasgupta, accompanying the participants, said a 10-minute capsule containing the day’s proceedings would be televised every night on various news channels during the duration of the rally. KOHIMA: The India-ASEAN car rally arrived here on Tuesday evening after covering 364 km on way to Indonesia. People lined up on the route to welcome the vehicles participating in the rally. The fleet of cars arrived two hours behind schedule. This 21-year-old BA final student of local MCM DAV College returned a five-under card of the opening day sending the officials scurrying for the record books. It was a course record, and also the best by any lady golfer in the country. Her performance on the remaining three days fetched her a record six-under score after the four rounds. This again was a record. A beaming Irina talked to the media. 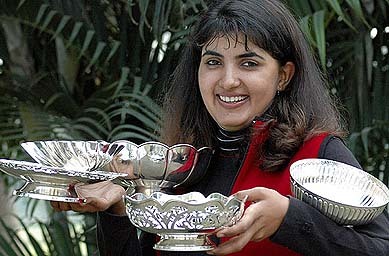 Along with her was her mother Madhu Brar.Shining trophies on the sofa at the Chandigarh Golf Club spoke of her performance in the Northern India Open. The nagging pain in the left shoulder and arm made her take pain killers during the entire tournament. But Irina was determined. She had to play to silence her critics And she came out in flying colours. The Principal of her college, Dr Puneet Bedi, has allowed her to take part in the tournaments. But Irina has been a good student throughout,. Once the Ladies Golf circuit is over she will be all into books. At the moment she is concentrating on her next destination Kolkata where she will play in the Eastern India Open Ladies Amateur Golf Championship from November 6 to 9. Irina is all praise for her coach Jessie Grewal.She also thanks Indian Oil with whom she has been employed as Sports Officer. Punjab men took a comfortable 34-17 lead at the breather to romp home with a splendid 71-31 win in the opening game of the tournament, in which six men and five women teams were participating. Snehpal (15), Sukhpal (11), Harpreet (11) and Gagandeep (10) were the main scorers for Punjab while V.P. Singh (nine) and Ranveer Singh (eight) were the chief scorers for Rajasthan. In another match in the men’s section, Chhattisgarh beat Indian Youth (Blue) 60-50 in an absorbing encounter. The winners led 30-23 at the break. In the women’s section, Chhattisgarh defeated Indian Youth 80-53. Indian Youth girls also lost their second successive match. They were beaten 43-45 by Delhi in the first game of the second day today. Saroya, who has been consistently winning the event, posted a time of 2:20.69 secs to finish second while Somdutt of Himachal Zone came third with a time of 2:22.89 secs. The trophy for the best marchpast was won by Northern Zone while East UP Zone emerged as runners-up. The 20th sub-junior Punjab boxing championship will be held at SAI centre, Mastuana Sahib (Sangrur), from November 25 to 27. Giving this information, Mr H.S Sidhu, acting president of the Punjab Amateur Boxing Association, said the meet would also act as trials to select the Punjab team, which would take part in the sub-junior National boxing championship.